Beautiful brunette woman typing on her laptop against black background. conceptual computer related motion graphics inscriptions. 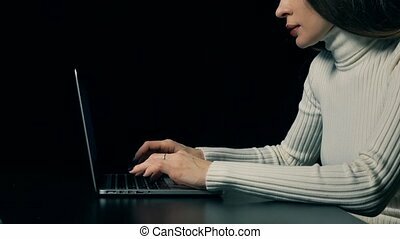 Beautiful brunette woman typing on her laptop against dark background. Beautiful brunette woman making online payment with her credit card using laptop. Black background, warm colors, space for inscriptions or infographics. Ecommerce concept.